1. To not be awakened by an animal for 14 mornings. 2. To keep his bar tab under $200 on the cruise ship. 1. For my foot to not touch the gas pedal of a car for two weeks. I drive 70 miles round trip each day for work and I have been doing a ton of driving back and forth to see Big Bro who lives an hour away. I an really really tired of driving! Hubby and I have a big trip coming up. On August 5th we fly away to Northern Europe where we will meet up with long time friends Barb and Jim from Seattle and jump on a cruise ship for 8 days. With Big Bro’s hospital stay it was touch and go there for a while as to whether or not we would be able to go. But, at this very second in time, it appears the trip is on. This trip has been five years in the making so the fact that it is so close, only six days away, is pretty darn exciting. Do you have a bucket list? I don’t, really. Hubby and I are pretty frugal, but one thing we love to do is travel and see new things. But, even though I do occasionally like to get out-of-town and see something new and different, I have been examining the concept of a “bucket list” lately. It made me realize that if I found out time is short, what I would want are more of are the happiest times I have now. That would be laughing it up with my family. When the four of us get together it can be a laughing good time, especially when it involves, yes, I am going to say it, poop. You see, poop jokes really get me laughing and Eldest Daughter has inherited this same problem. So what happens is some discussion of poop occurs, such as whether or not Blackie the cat’s digestion is going well or the issues with Honey the dog’s latest unwelcome deposit, and Eldest and I start laughing. Hubby and Youngest Daughter do no share this same sense of humor. But when Eldest and I are rolling on the floor with tears running down our facing, helpless with laughter, they can’t help but laugh at us! But, back to vacation. You can imagine me frantically thinking about all I have to do to get ready for this trip, but, yet, it is a bit too early to do most of it yet. Too early to pack, too early to stock the house with the perishable food for the girls, etc….I am also wondering about this here blog. I have one story in the queue for you all, but nothing else yet. I don’t know if I will be able to blog while I am gone. So, if any of you readers out there would like to guest blog, feel free to let me know. I would be happy to line it up to publish while I am gone. Please let me know this weekend if you would like to. I am open to a previously published blog post that you just happen to be very fond of. Meanwhile, you are sure to hear from me again before the trip begins, if only to cry and whine about getting ready! Hope you have a great weekend! Over the past few weeks Hubby and I have gotten to spend quite a bit of time with Big Bro on his home turf. We have been to multiple doctor’s offices, the store, and the bank. We have been flabbergasted that, every time Big Bro goes to a familiar place, he knows the name of EVERYONE who works there and he greats them with great cheer by name. I can say first hand that this really makes an impression. I called the office of one of his doctors last week and I couldn’t even got Big Bro’s whole name out before the receptionist said, “He was supposed to have an appointment today. IS HE OK?” Yes, the capitals were necessary to express the frantic concern in the receptionist’s voice. Believe me, there has never ever been anyone, including the doctor, at a doctor’s office that had expressed that much concern about me! Watching Big Bro work a room, saying “Hi” to all the folks by name has been quite the eye opener. It has made me think. Maybe I could try a little harder to learn people’s names. May be I could try a little harder to give a cheery greeting. Maybe I could spread sunshine like my Big Bro. I tried it today. I called a fellow who comes into my work regularly by name twice. I was so proud of myself! Until I heard a coworker use his name. His name is Dario. I called him Darius. Twice….Sigh. I have a ways to go before I can match Big Bro! As I mentioned in my last post, Big Bro was in the hospital. Eight longs days in a hospital at least an hour away from us. He is now home, I am happy to report. He is getting around, fixing his meals, and going to meetings with friends. We are hoping this storm has passed and it will be smooth sailing for a little while at least. 91 Freeway – You are a Cruel Mistress! The shortest distance between my house in inland So Cal and the beaches, shopping, and theme parks of Orange County, California, is by way of the 91 freeway. The problem is that unless you are using the 91 freeway at 2 a.m. you never know what you might run into. Last Friday night at 10 p.m., on the way home from rushing down to Orange County to see Big Bro in the hospital, we ran into quite a bit of traffic and it took us about 30 minutes longer to get home than it should have. Really? 10 p.m. on a Friday? Who are the thousands of people coming from Orange County to points east at that time of night? The 91 freeway runs through a canyon, the Santa Ana River Canyon to be exact, which means that there are very few services along the way. Few bathrooms, few Starbucks, few anything. That also means that there aren’t any surface streets that you can get off on and use in case of a problem. A few mornings ago there were not one, not two, but three accidents at various points along the 91. The radio reported that it was an eight mile long parking lot. Sure glad I wasn’t trying to go see Big Bro then! Several years ago Hubby was transferred to an office in Orange County and had to use the 91 to get to work. That was four months of real nastiness for him. The people who drive the 91 are a special breed and they are just crazy. He had so many near misses during that short period of time. One night on the way home a crazed woman in a minivan clipped him which caused him to spin out. When the car stopped spinning he found himself sitting sideways in the lane of traffic with the driver’s side (and him) facing the on coming cars! Hubby spent that fours months looking for a job that was NOT on the 91. He found one, thank goodness and the madness ended. Well, ended except when we want to go to Disneyland or the beach or visit Big Bro. Doctors and Nurses, Oh My! Poor Big Bro became very ill on Friday and had to be rushed to the hospital. I am happy to report that after a few pints of blood and a few days in ICU he is feeling much better, as impossible as that seems. But having to deal with what I term the “medical establishment” once again has left me baffled and bruised. Here is why. 1. Me, my brother’s closest family member, never got to speak to a doctor. I saw one, once, accidentally, but every time I tried to ask for one I was put off by the nurses. I love nurses, but I would have liked to speak to the doctor. I wonder why they made it so hard to do so? 2. Nurses, God love them, shouldn’t be making sweeping statements to family members such as “he is too frail to live alone.” Things like that tend to get us all worked up. How about we all take a big breath and at least wait untill the patient has been in the hospital for 24 hours before starting to draw such conclusions? 3. Why, oh why, would you restrict visitor access to patients every night between 7 and 8 for a shift change? Isn’t that when a lot of people would drop by to visit a patient? And, when that is the policy, why would a nurse not mention that when the family member says they will be there at 7 p.m.? Especially when the nurse recommended the family members drive from another county to visit said patient THAT NIGHT? 4. Finally, while having soothing voices is certainly a plus for nurses, they shouldn’t sound like they are narrating a ride at Disneyland. Having difficult news delivered in the lilting voice of a Disney princess is, well, just weird. Sorry I seem to be complaining about nurses so much but it was a trying weekend and, as I mentioned, they are he only ones I got to speak to and deal with. I am sure if I had actually gotten to speak to a doctor I would have had a few things to say about them as well. So here is hoping Big Bro can go home to his home soon, as I am sure that is what he wants. If not he is coming home with me. It just so happens that the lay out of the building where I work has the women’s restroom right next to the break room/kitchen. The doors are actually quite a distance apart but the two rooms share a wall. The break room includes such things as a toaster oven, coffee maker, and microwave, nothing too unusual there. But there is one odd thing I have noticed. When I enter the ladies room I am often greeted by the smell, the strong smell, of whatever is being cooked in the break room. Since I am there from 7:30 a.m. to 12, is usually breakfast things such as toast or cinnamon bread. I have been greeted by much worse smells in bathrooms, belive you me! It actually smells quite good. But I can’t help but wonder…if the delicious odors of the break room creep into the ladies room, …does something less, shall we say, desirable creep back into the break room? I can’t help it. This is just the way my mind works…. It was a Crappy Day…Really! If you find pet stories involving poop offensive, I advise you to run from your computer as fast as you can. The following story is not for the faint of heart! Last week was not a good pet week. Blackie was quite out of it on Tuesday and I took off work to take him the vet. They had to do blood work to see what was going on in his chubby body, but meanwhile the exam showed he was quite constipated. They decided to give him an enema. Just for future reference, a cat that has had an enema will likely smell bad and will need a bath. That is what Hubby and I did Tuesday evening – bathe an already unhappy cat. Blackie is a nice cat, though, and it went very well and no blood was lost, by him or by us. I really thought that would be my animal poop story of the week. Oh, how wrong I was! Saturday morning I let Honey out and then wandered out the gate to the driveway to retrieve the newspaper. When I got back something didn’t seem right so I looked around and saw no evidence of Honey’s morning constitutional. Hum…I decided that I needed to let her out again in an hour or less. Ah, the best laid plans! 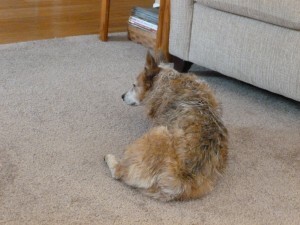 Fast forward 3 1/2 hours and Honey had yet to see the outside world again when the lawn guys arrived. Honey hates the lawn guys. They have noisy machines that come right up to the windows. So she started her lawn guy barking routine. I was at the computer and tried my best to ignore her as much as possible. This went on for a little bit with her running around and barking when I decided to look up and tell her to be quiet. From the computer I can look to my left and see straight to the sliding glass door into the back yard. Unfortunately, when I looked over I was able to see that Honey had made a deposit on the rug that we have there. Yes, the same rug that Blackie recently threw up on. I am beginning to feel very sorry for that rug! I got up to deal with the deposit when I was greeted by a rather horrifying sight. You see, Honey has absolutely no interest in what is under her feet. She steps on anything that is on the floor as if it isn’t there. That is what she had done with her fresh pile of poop. Stepped in it, kicked it around, ran through the den, kitchen, and office with it on her feet…Poop was literally everywhere. I have never seen poop spread so far and wide and on so many different surfaces in my life! As I gasped in horror, I smelled a weird and awful smell. Honey’s poop smelled like coffee! Well, coffee and poop. “Why does Honey’s poop smell like coffee?” I asked. Eldest Daughter told me she had just made a cup of coffee so I really was smelling coffee. Just then Youngest Daughter emerged from her room to see what the commotion was about, and, smelling the nauseating brew of poop and coffee, retreated as quickly as possible. She later told us that while it wasn’t the worst thing she had ever smelled, it was definitely top 10 for her! I ran to the shop where Hubby was doing some woodworking, and told him what had happened and that I could not face this situation alone. We came in and I put the dog in the garage because the hated lawn guys were still present. I banished Eldest and her coffee to her room and Hubby and I just stood there, not knowing where to start. Finally, with paper towels in hand, a plastic bag for the trash and pickings nearby, and bucket of sudsy water at the ready, Hubby and I went to work. Forty five minutes later we were reasonably poop free once again. Final count was five rugs or carpets, three rooms, 20 feet of hallway, and a garage were adversely affected. This is Honey after her bath with her “What the hell happened?” look. To help in our recovery from this horrific situation, the whole family took a trip to Orange County to a great used bookstore we recently discovered as well as to have dinner. I didn’t think it would be possible so quickly, but on the way home we started talking about the poopy nature of our week, and especially the events of the day and we all started laughing, and laughing, and the tears ran down my face, and we all laughed some more. Saturday July 6th, 2013 will go down in infamy as the day of THE WORST animal mess ever. Numero Uno, so far ahead of any other poopy experiences we have ever had, that it is hard to imagine it will ever be topped. But it was still pretty funny! After the poop was cleaned up, of course! By the way, Blackie is feeling much better and we are trying to make sure he is never constipated again. Last night Hubby and I and one of our daughters went to the local mall. We had dinner, looked around a bit, and then crossed the parking lot to check out the book store. When we decided to leave we had quite a bit of parking lot to cross to get back to our car. Since we live in the land of the automobile, otherwise known as southern California, we didn’t have sidewalks to use. We had to walk through the parking lot, crossing parking spaces, etc… to finally arrive back to our car. It was during this journey across asphalt when I saw it. There it was, just like I have seen in so many parking lots before. It was a Q-Tip. Maybe I am just “lucky,” but I see Q-tips scattered across parking lots everywhere I go and I don’t understand why. I buy Q-tips. I use Q-tips. But they live in my bathroom and the lengthiest journey they go on is to the back yard when one of the three women in my house is doing a little al fresco nail painting and wants to take a Q-tip along for an after painting touch up. So it a huge mystery of life to me how these Q-tips end up in parking lots. Is there a use for Q-tips that has escaped my notice? Do people clean their ears in their cars? Are Q-tips useful in some sort of illicit drug ritual, like a straw with coke or a spoon with heroin? Should I just be pleased that people in southern California take their hygiene/grooming so seriously that they must have Q-Tips with them everywhere? By the way, this is Mystery of Life post #1 because I just have a feeling I am going to run across more mysteries of life! 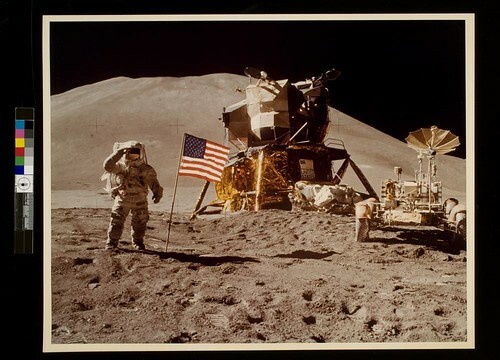 James Irwin gives a salute next to the U.S. flag while hanging out on the moon. Youngest daughter is a mechanical engineering major. This summer, after three years under her belt, she was determined to get an internship to add to her resume. Happily, she found one close to home. We aren’t exactly the engineering capital of America where we live. More of those jobs are found in the Los Angeles and Orange County areas. So when she found an internship close by I was very happy that my little chickie would be home for the summer. Youngest was happy because she is earning actual real live money and applying her skills. The internship is in an aluminum can factory. They make cans for several well-known brands of beer, soda pop, and energy drinks. Hubby and I go to our same old jobs every day, doing the kind of thing we have been doing for 30 or so years. Eldest Daughter is slogging through an online Spanish course. So the most new and fascinating thing in our lives this summer is hearing about the making of aluminum cans every night when Youngest gets home. This whole manufacturing process is so foreign to us because none of us have ever worked in a giant factory before. This place makes up to 11 million cans a day. Wow! All of us are just plain curious people so we enjoy learning about something we have never heard about or even thought about before. It is fascinating! On top of that, this company gives out free beer to its employees. Youngest (who is 21) got two 12 packs on her first day and apparently everyone gets free beer once a month. So, between the beer and the internship, this is turning into our summer of the aluminum can! The factory where Youngest is working doesn’t make Coke cans, but Coke is one of my favorite all time beverages, so I couldn’t resist using a picture of a Coke can here!